Appendix 9. Some postresurrection teachings. The earliest substantive sources available for historical Jesus research are in the Gospels themselves; when interpreted in their early Jewish setting, their picture of Jesus is more coherent and plausible than are the competing theories offered by many modern scholars. So argues Craig Keener in The Historical Jesus of the Gospels. In exploring the depth and riches of the material found in the Synoptic Gospels, Keener shows how many works on the historical Jesus emphasize just one aspect of the Jesus tradition against others, but a much wider range of material in the Jesus tradition makes sense in an ancient Jewish setting. 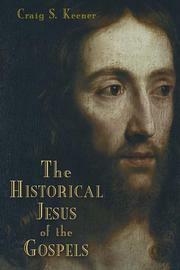 Keener masterfully uses a broad range of evidence from the early Jesus traditions and early Judaism to reconstruct a fuller portrait of the Jesus who lived in history. - Publisher. Add tags for "The historical Jesus of the Gospels". Be the first. library:placeOfPublication <http://experiment.worldcat.org/entity/work/data/255983124#Place/grand_rapids_mich> ; # Grand Rapids, Mich.
schema:about <http://experiment.worldcat.org/entity/work/data/255983124#Person/jesus_christ> ; # Jesus Christ. schema:publisher <http://experiment.worldcat.org/entity/work/data/255983124#Agent/william_b_eerdmans_pub_co> ; # William B. Eerdmans Pub. Co.
<http://experiment.worldcat.org/entity/work/data/255983124#Agent/william_b_eerdmans_pub_co> # William B. Eerdmans Pub. Co.
<http://experiment.worldcat.org/entity/work/data/255983124#Place/grand_rapids_mich> # Grand Rapids, Mich.
schema:location <http://experiment.worldcat.org/entity/work/data/255983124#Place/grand_rapids_mich> ; # Grand Rapids, Mich.
schema:organizer <http://experiment.worldcat.org/entity/work/data/255983124#Agent/william_b_eerdmans_pub_co> ; # William B. Eerdmans Pub. Co.